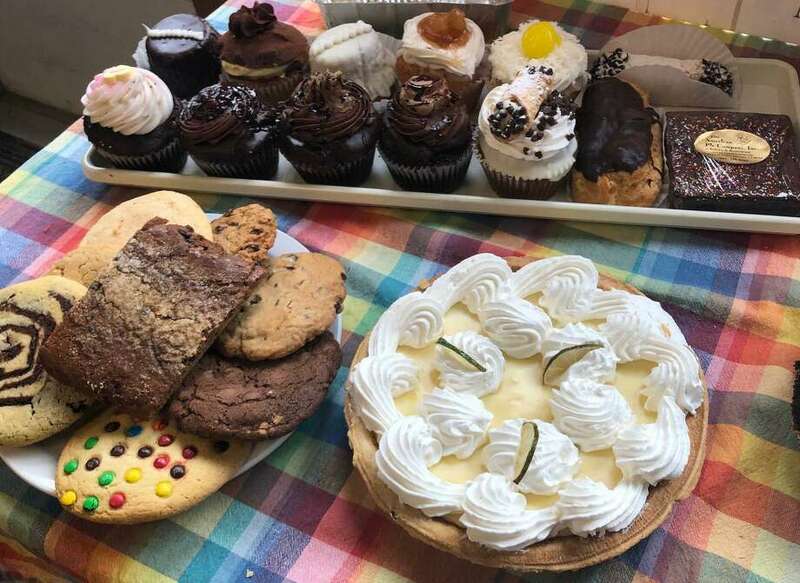 American Pie Company in Sherman is well known for its homestyle cooking and delicious baked goods, like the assortment of cupcakes, pies, cookies, brownies and other treats shown above. The American Pie Company is a staple in Sherman. Patrons come from near and far — some from lower Fairfield County, New York and eastern Connecticut — for the restaurant’s popular chicken pot pie and/or a homemade treat from the bakery. “The food is so good and the establishment itself is inviting,” said customer Don Lowe, Sherman’s first selectman. He said the restaurant has made a name for itself outside of the community, too, so much so that when he introduces himself as being from Sherman during his travels in the region and beyond, people recognize he’s from the same town as American Pie. “It’s a real treasure to have” in town, he said. The restaurant —which celebrated its 25th anniversary last May — serves breakfast, lunch and dinner, while the bakery specializes in custom cakes, eclairs, cupcakes, cookies, pies and more, as well as grab-and-go items. “We always have something for everybody,” said Bill Hunniford, who co-owns American Pie with business partner Audrey Day. The main menu boasts appetizers, salads, soups and chilis, sandwiches and wraps, burgers, grilled chicken, pub steaks, pasta and specialties such as the restaurant’s popular chicken pot pie, turkey dinner, cottage pie, Yankee pot roast and crab cake dinner. Pizza is served Fridays through Sundays, family meal deals for families of four are offered throughout the week for $23.99, and general and holiday catering of hot and cold foods are available. “Everything we’ve ever tried there has been delicious,” said Renee Gardner of Brookfield. The restaurant employs about 40 individuals, many who have been there on average of 10 or more years. Some younger wait staff resume work at American Pie during their college breaks, Hunniford said. The co-owners are fully invested in the business. “We don’t mind really rolling up our sleeves and doing the work,” Hunniford said, citing that might include greeting and seating customers, clearing a table or washing dishes. Hunniford can often be found visiting tables to check on the customers’ meals, while Day finds the bakery “her happy place,” where she can help develop recipes and try new things. The co-owners praised retired chef Herb Krug, former owner of the Cake Box in New Fairfield, who in the early years of the business established many of the recipes. “If you really want something (from the bakery), ask us to set it aside,” Hunniford advised customers who plan to dine in and then purchase a bakery item, noting the freshly baked items sell quickly. Gardner said her family looks forward to dining at American Pie, and plans ahead for what they will get for dessert. Day said the business’ success is due to the customers. The business has grown since its humble beginnings. The bakery was first situated where the counter is today. About a year later, the co-owners opened the space, moving the bakery and providing a larger entrance. The full bakery was moved downstairs about 10 to 15 years into the business, allowing even more space to showcase sweet treats. Outdoor dining on the patio was added in most recent times. The American Pie Company, located at 29 Route 37 in Sherman, is open daily. Catering, family meal deals for four, early bird dinner specials from 4 to 6 p.m., pizza nights Fridays through Sundays, and kids eat free nights Tuesdays and Wednesdays from 4 to 8 p.m. are available. For more information, call 860-350-0662.